I went out to the winter 1861 camp looking for a pit and found a small one. It had a small amount of broken glass and a bunch of nails. 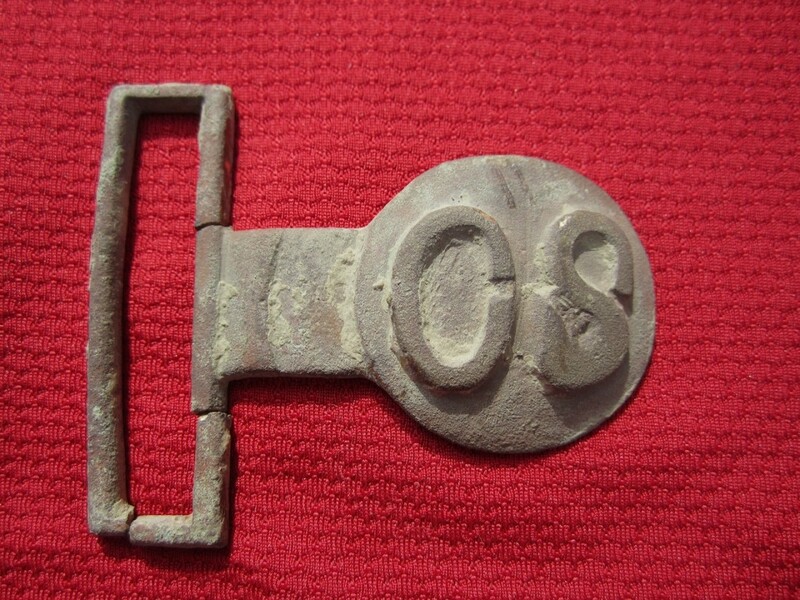 About a foot or more down into the thing, I dug out this coin purse clasp. Swept back over the same spot and got a nice high signal with the new F19, so obviously I'm got really excited. I pull out a scoop of dirt and located the target. 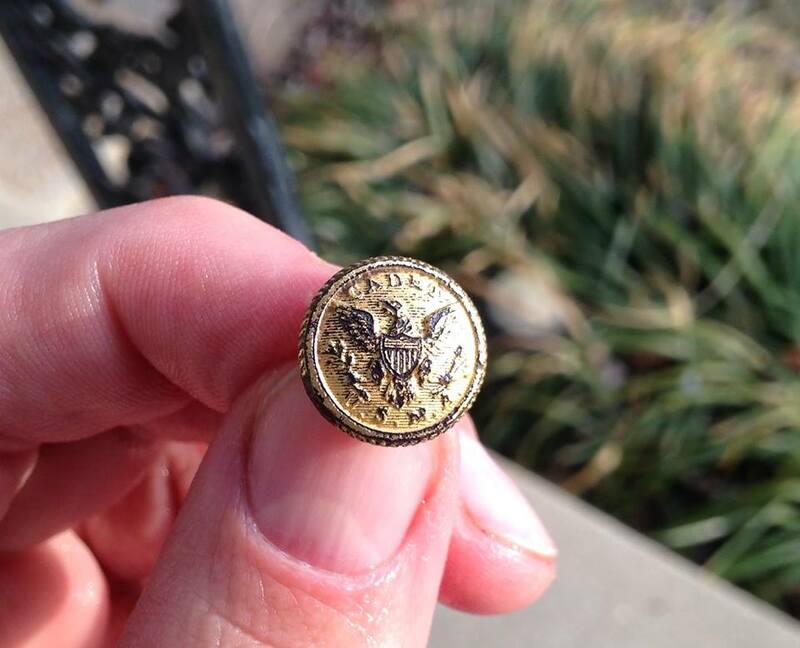 At first glance, thought it was a bullet, but after a rub of the dirt, I realized I had a solid silver thimble. Once I got home and started cleaning it out, I noticed it had two small white underwear buttons inside- a very cool find if nothing else. 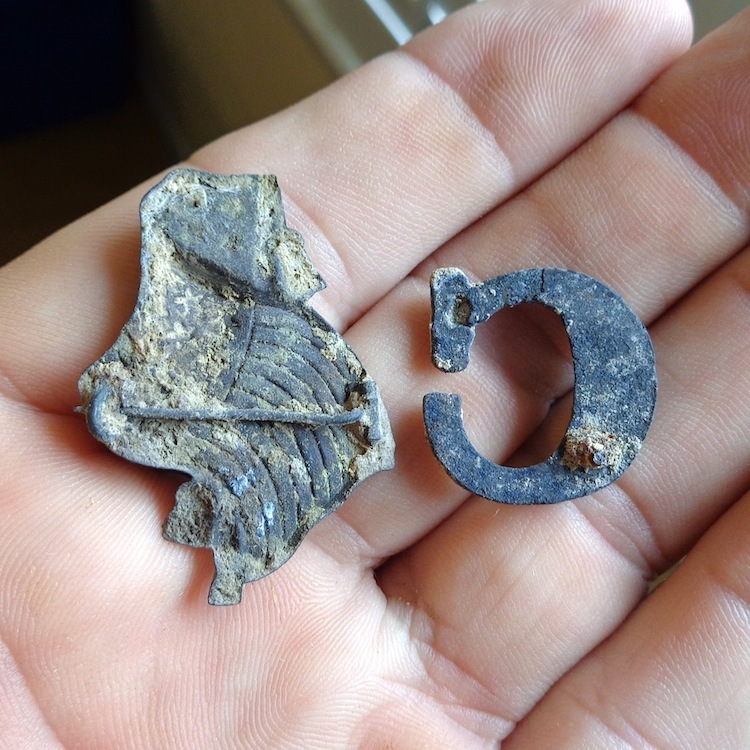 Among the other finds were two carved pieces of lead, one carved into the shape of a square nail. 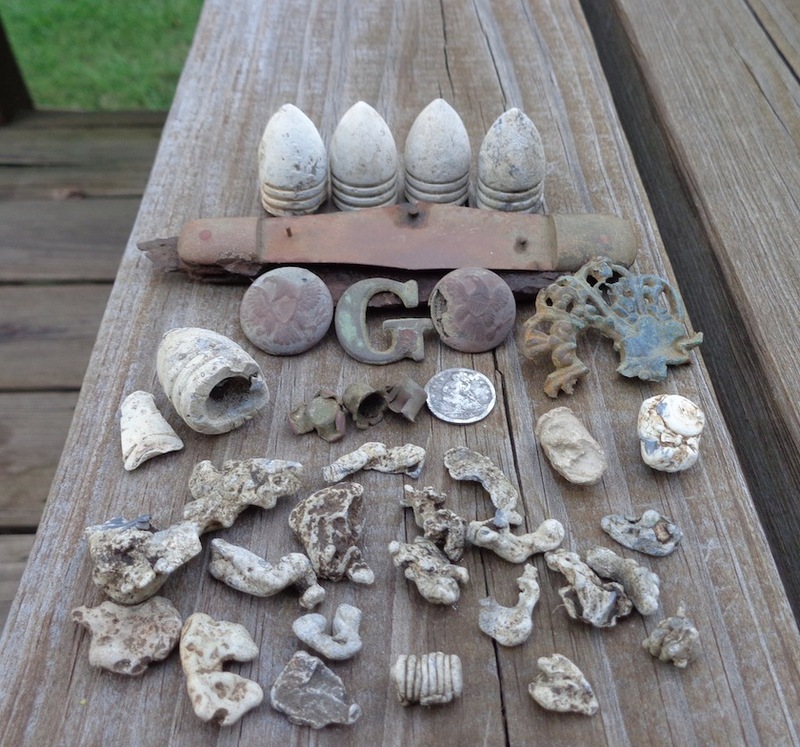 Being in Missouri and the western theater of the Civil War, I never dreamed I would be able to hunt a site with this type of quantity and quality in this day and age. Most of us have seen the amazing relics that continuously come from the camps out East, but rarely do these pop up out here. On Thursday, January 22nd my hunting partner and I set out in search of CW-Era relics in an area that we had researched and man! -- we had no idea what we were about to get into. At about noon that day, we hit one of the outer edges of this enormous Cavalry and Infantry camp. Unbeknownst to us, that afternoon, it was only just the beginning. 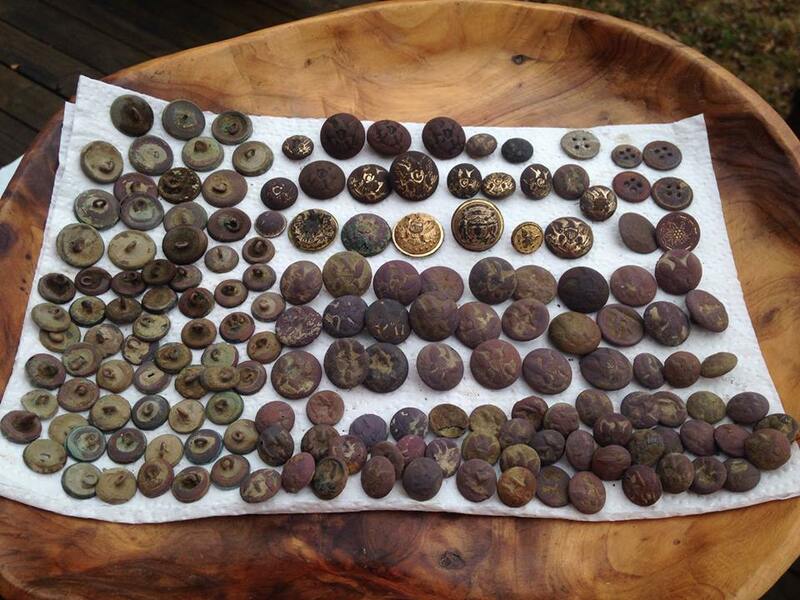 Now, after 10 days hunting this dream site, we have over 300 military buttons and over 500 bullets! 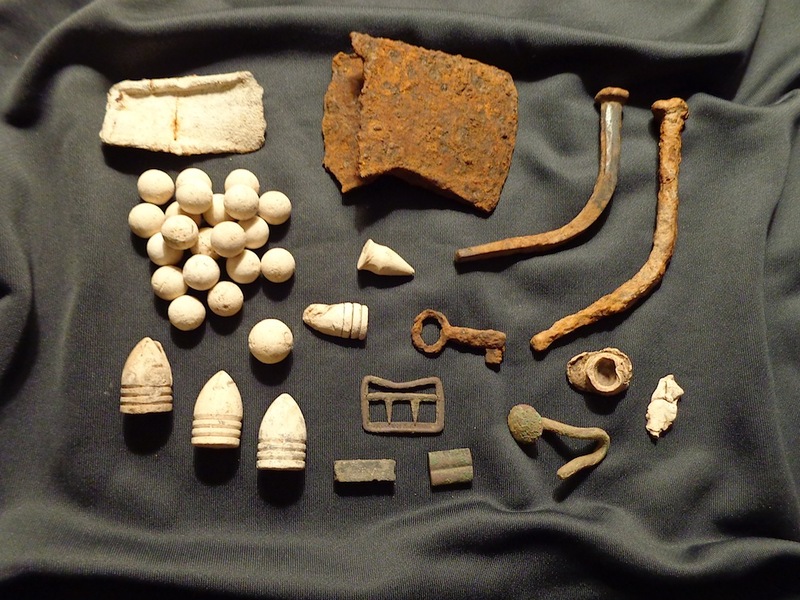 This place, like so many other camps, is littered with thousands upon thousands of square nails and other various pieces of period iron. To say the least, the Fisher F19 has performed extremely well in the iron and pulled out these pictured targets. 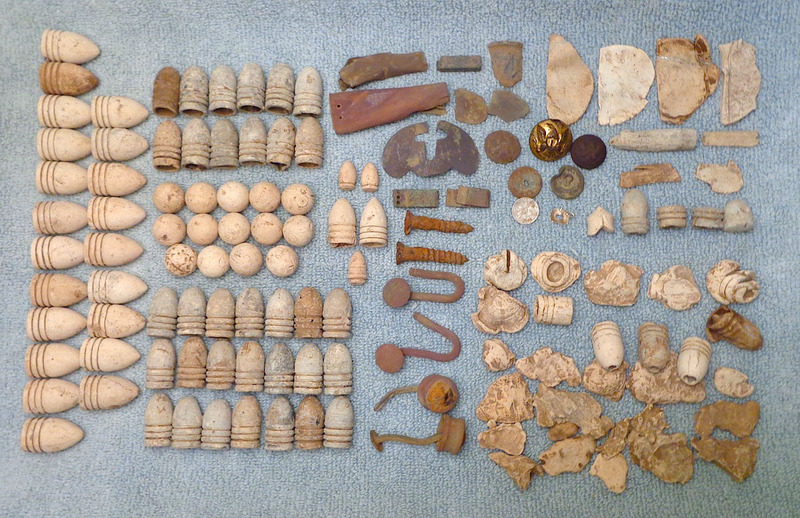 Once we have recovered the majority of the non-ferrous items, we will be back for the iron relics as well. Anyone interested in one of these machines? Feel free to contact me with any questions about set-up or performance. I am confident this is one of the premiere relic machines on the market! Wow, the F19 continues to impress by pulling targets out of the heavy iron in the camps! 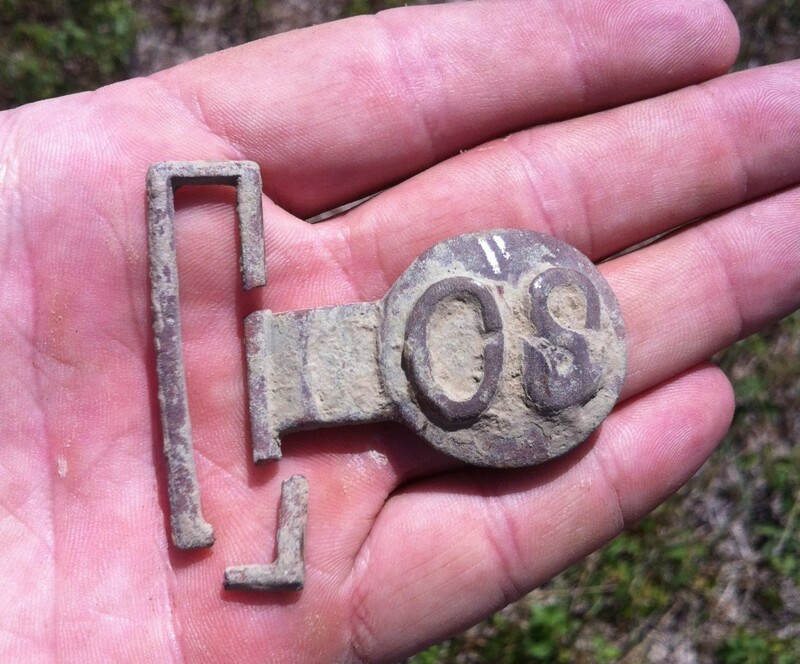 Here's a crossed saber hat insignia dug in Arkansas at the site of a Wisconsin Cavalry camp. The group photos are some of the other finds from the camp and some from my hometown in central Missouri. 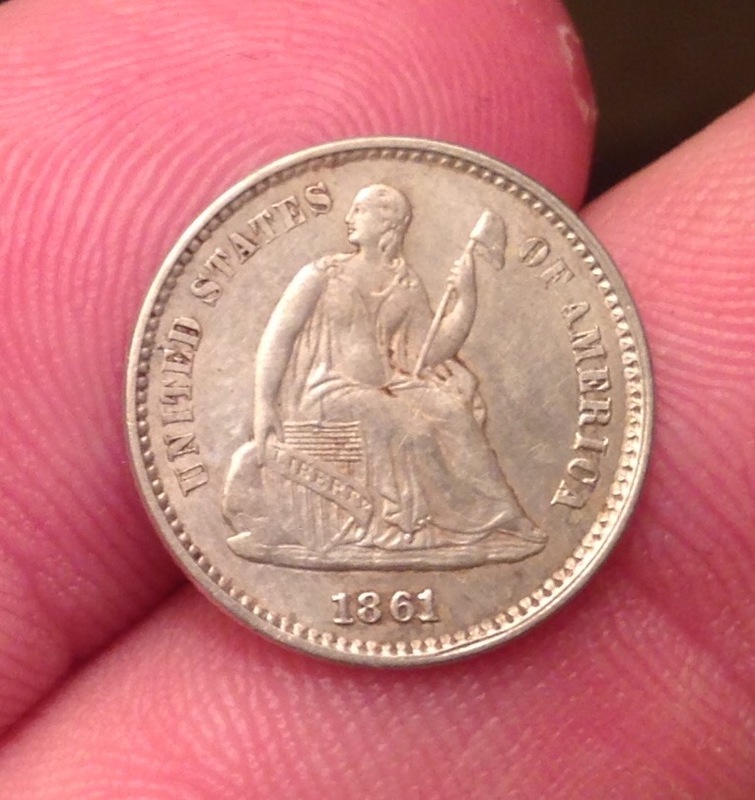 Last but not least, the F19 sniffed out this 1804 Draped Bust Half cent today! That's just about as old as it gets around here -- my county wasn't settled until the 1830's. 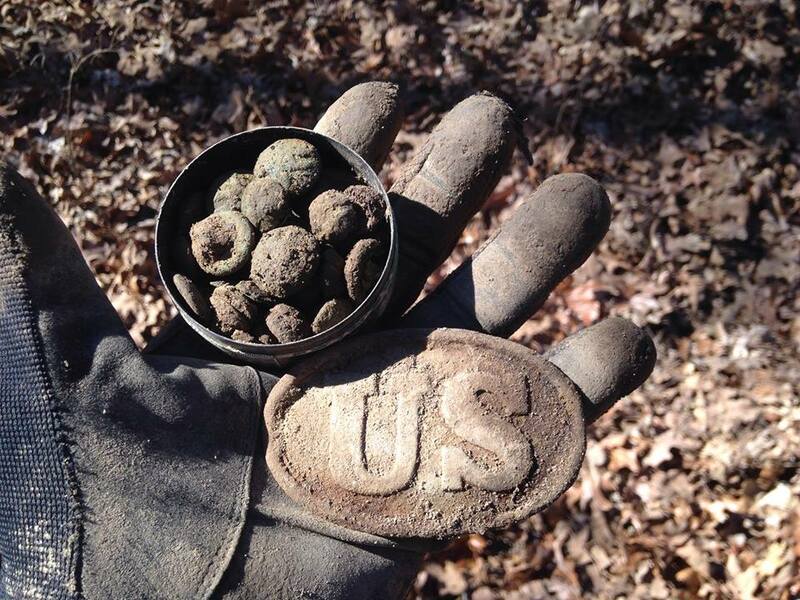 These civil war finds are recent finds from hunting here in central Missouri. I recently purchased the F19 after using the Gold Bug® DP and the F75Ltd over the last couple years. For the money, this machine definitely holds its own. 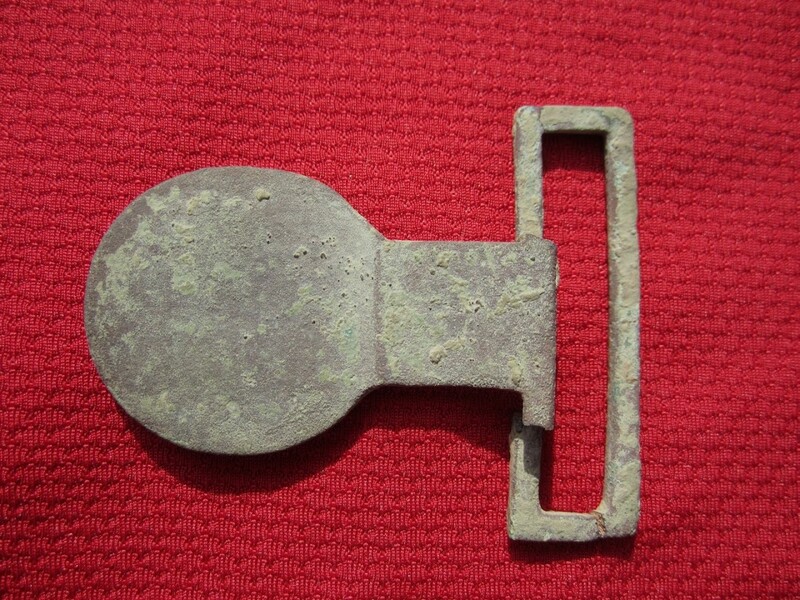 I find that it will hit hard on deep bullets in open ground, but will also distinctly separate a good target in the middle of a square nail bed (so commonly found in civil war camps). 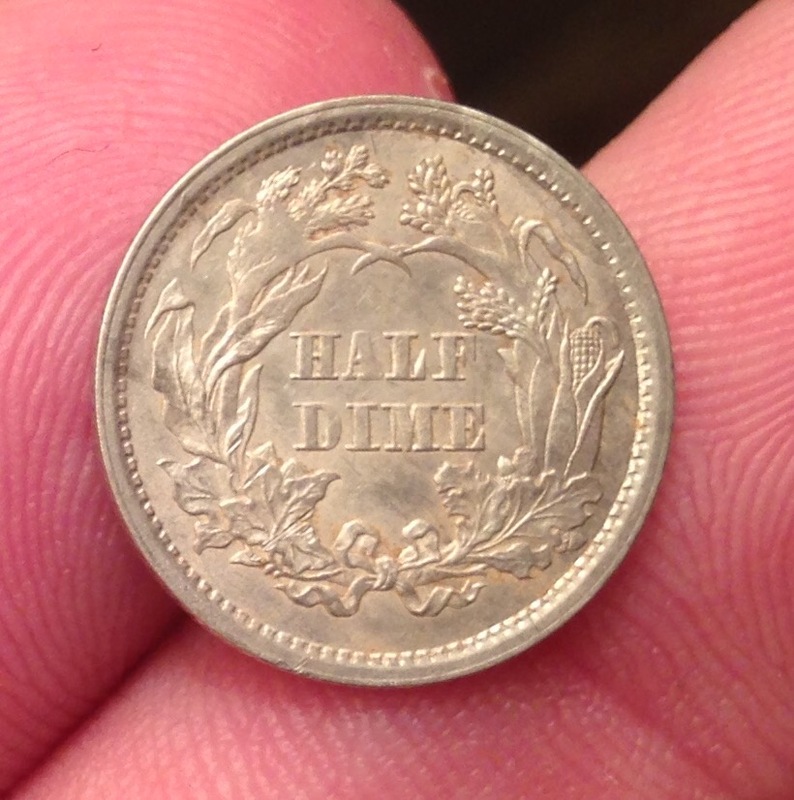 Both coins were mixed in with a heavy concentration of nails, and were both very clear signals. 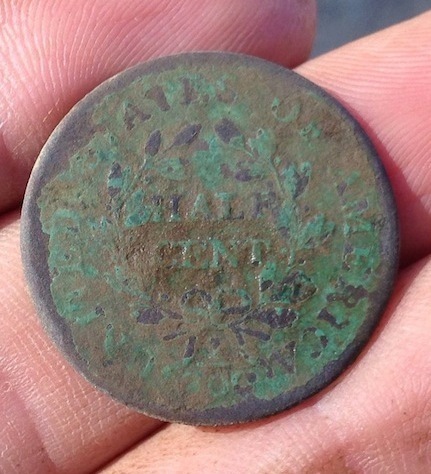 The medal is Prussian, dated 1814. It was awarded to the Prussian warriors who fought Napoleonic France from 1813-1815 - quite an oddity for central Missouri. 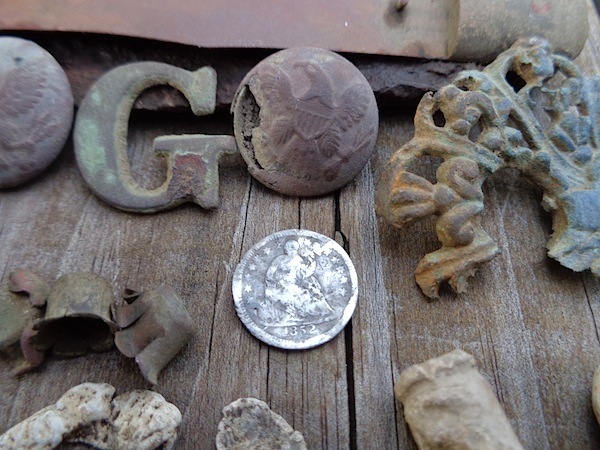 Finds from a fire pit dug at an 1861 Union camp. Bottle remains are bitters, whiskey, pepper sauce, champagne bottles. Bone fragments, gun screw (? 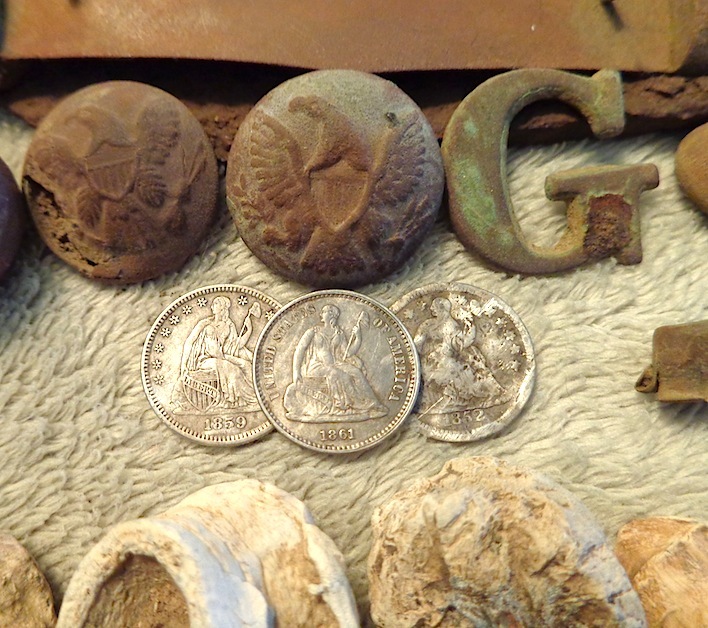 ), melted lead, part of a belt adjuster, three .69 bullets, a pipe bowl and an eagle Infantry vest button that still has ringlet attached to the shank. 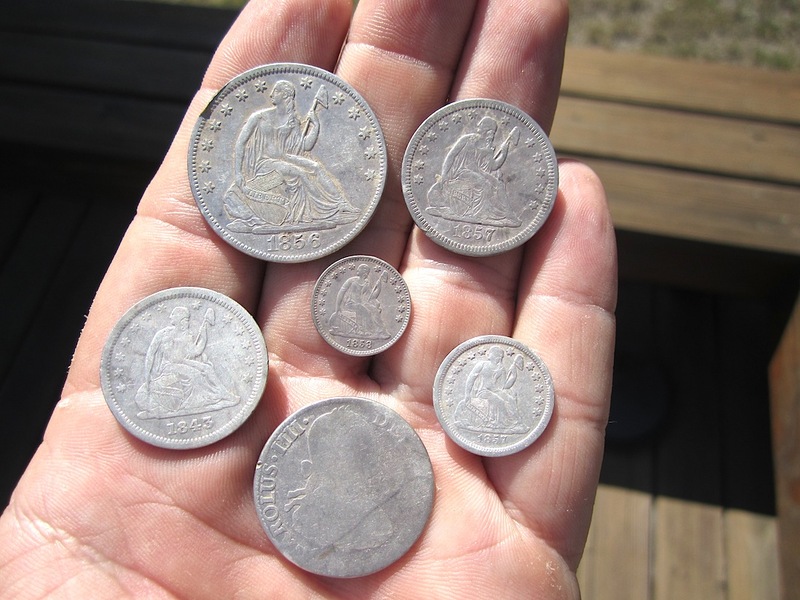 Silver spill from August 2012 (1858 half-dime, 1857 dime, 1843 quarter, 1857 quarter, 1856 half dollar, late 1700s Carolus IV 2 reales). Posy ring found May 2010 in Hampton, VA. It was made between 1630-1662 in Salisbury, England, by John Greene III. It reads “the god of peace our love increase”. 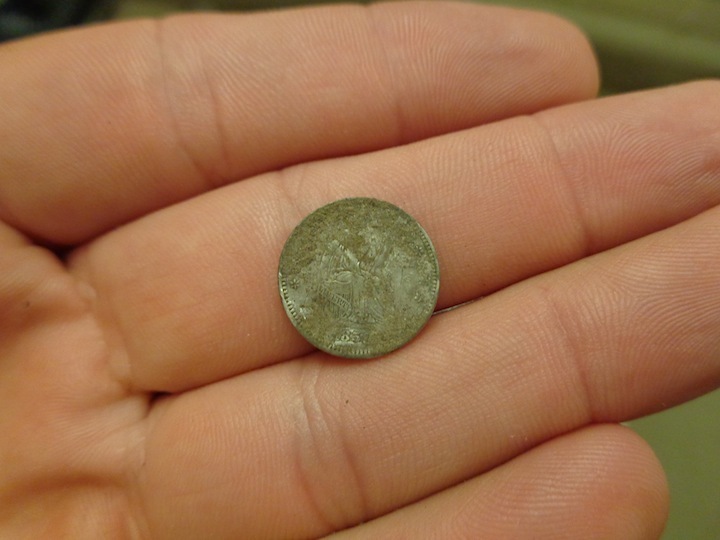 The 1699 silver cob was found same day about 50 feet away. 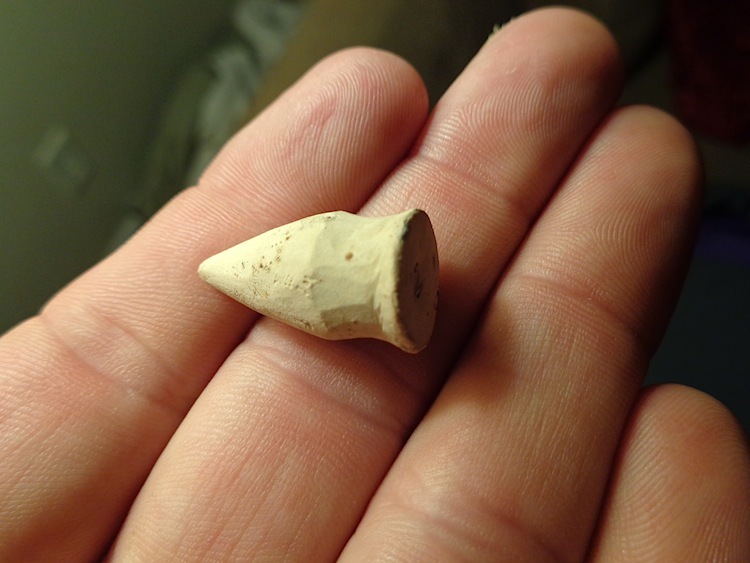 Found this small sword/dagger hilt back in 2008 in upstate NY near a Rev War battle site. I was told it is 18th century French in origin, and that the face in the casting is possibly that of 17th century French Masters of the Sword. Found another relic hotspot today at one of my favorite sites…there is a bunch of iron in the area, so there should be more relics and maybe a fire pit. 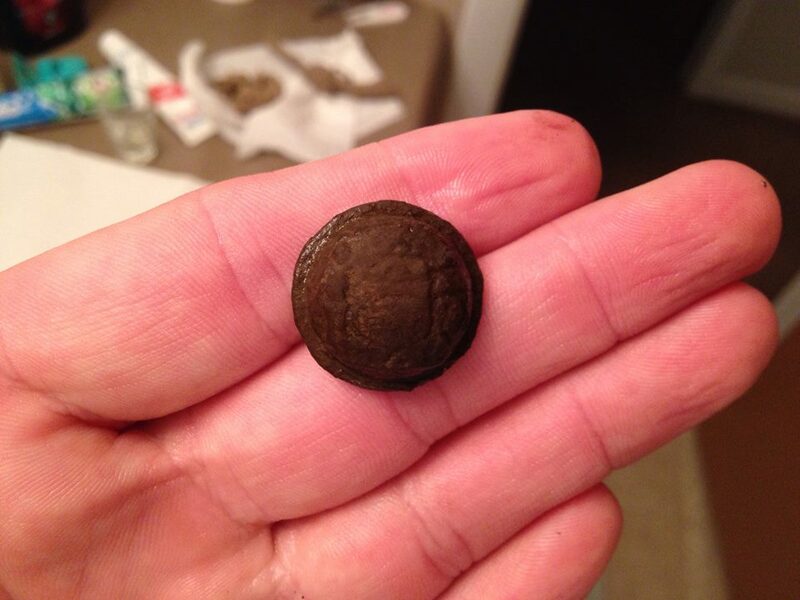 Another Eagle Calvary button with the rare back-mark of MANZANEDO & ABRISQUETA. The canteen spout has initials carved in it, but they illegible due to corrosion. 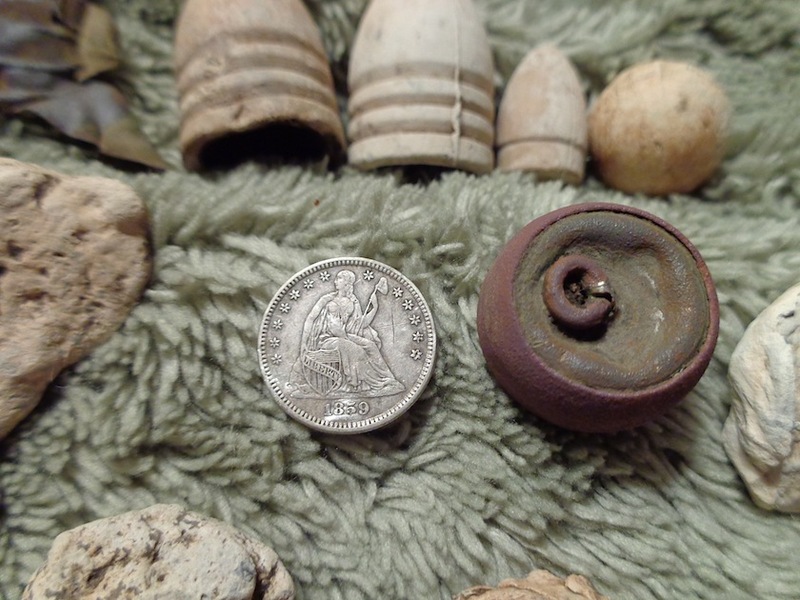 The two small bullets are rare Tranter revolver bullets. The pipe bowl says “Frank Pierce” on one side and “President” on the other. Franklin Pierce was our 14th President (1853-1857). More finds from the Civil War camps, including the best carved bullet I have found so far. 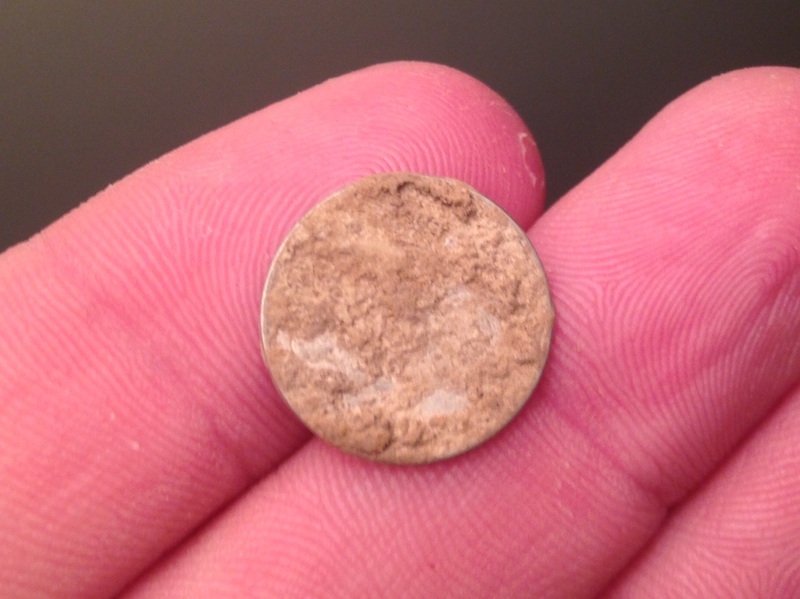 Union winter camp find, in the center of a Hut location, I dug this quarter at 9” deep. The audio was a faint, bouncy signal due to all the iron targets around it. 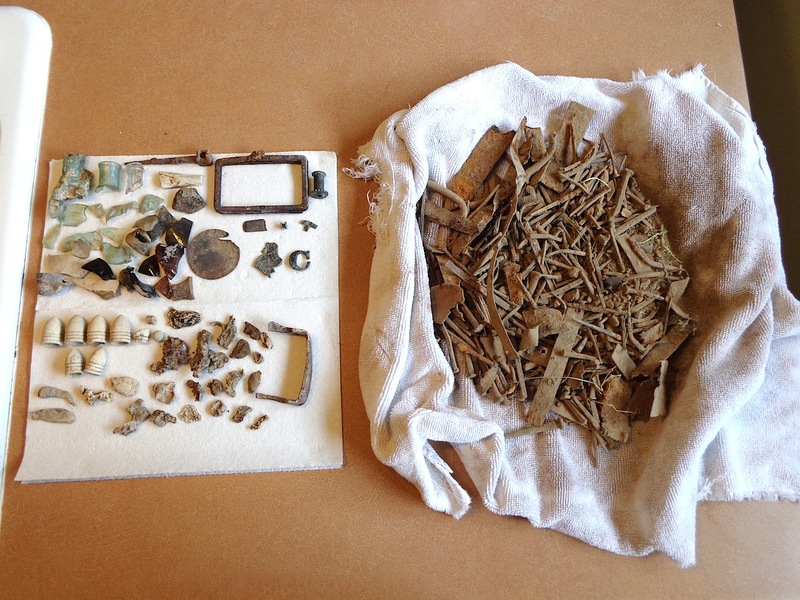 Finds from a Union winter encampment of 1861/1862. I used the F75 SE and hunted in the All Metal Mode. 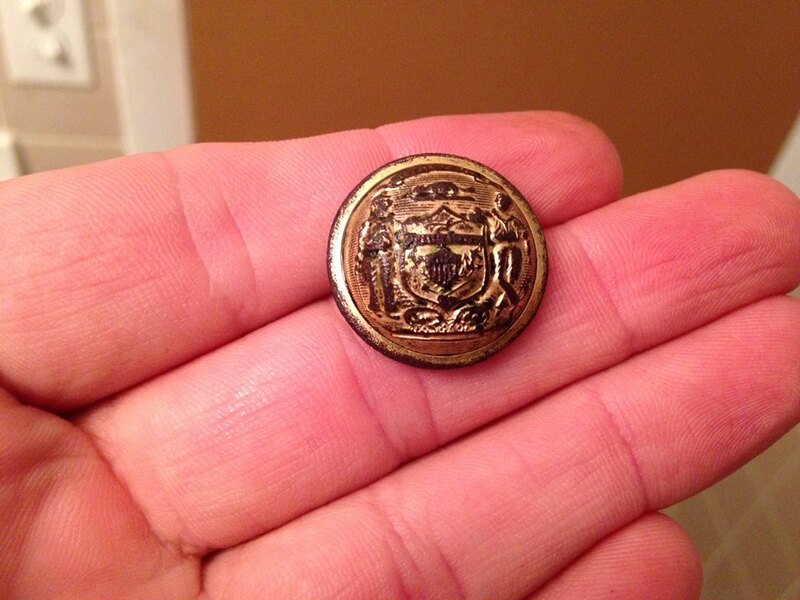 Found today a very rare Cavalry button with a back-mark of Manzanedo & Abrisqueta. 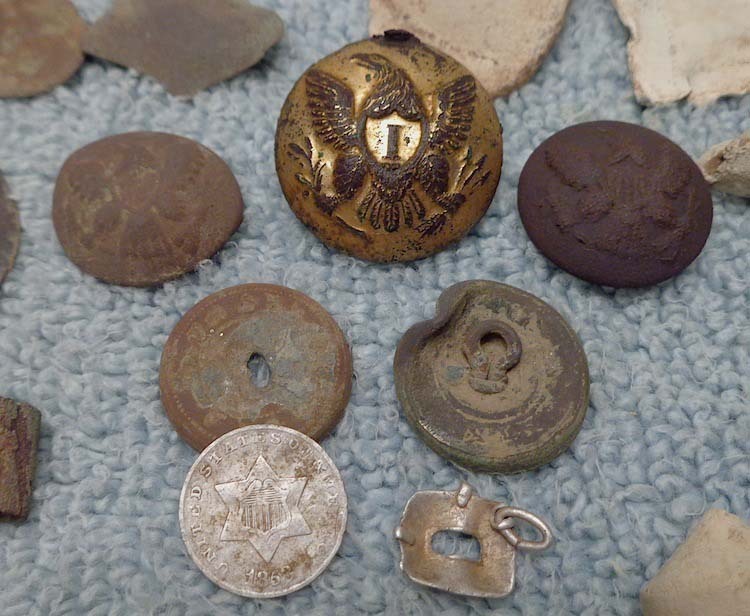 They were made by Scovill and I assume these backs were excess from a different contract and then slapped on these Civil War buttons. Its hard to see in the picture but "..NEDO & ABR.." is legible, the rest is fried. 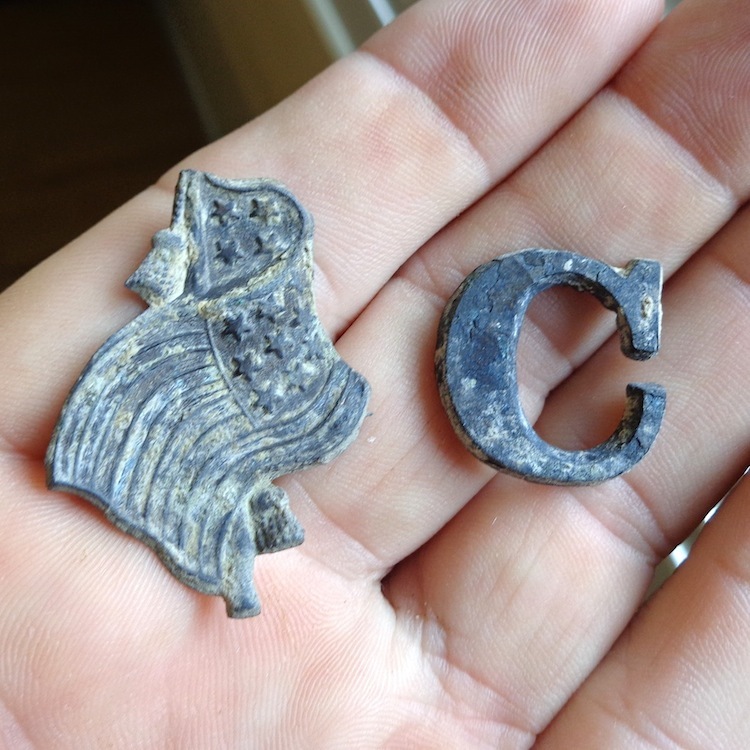 Finds from a Calvary camp. 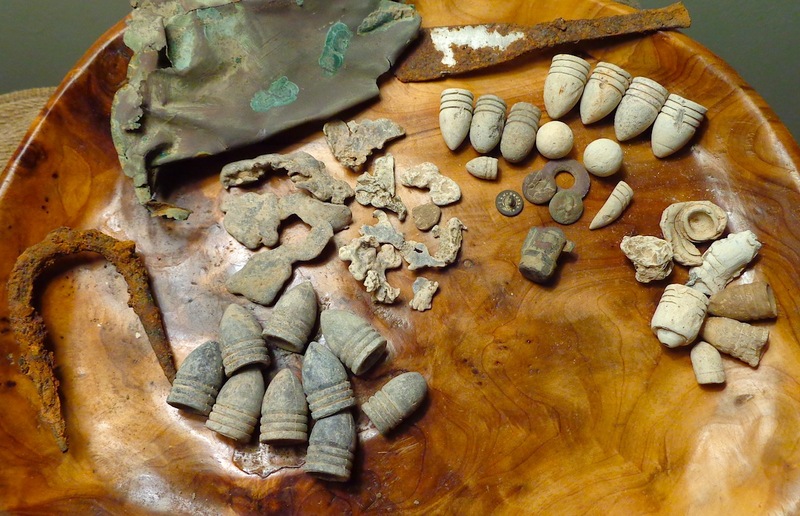 The ring is gold plated, and the sabot pieces on the right are from rare James shells. 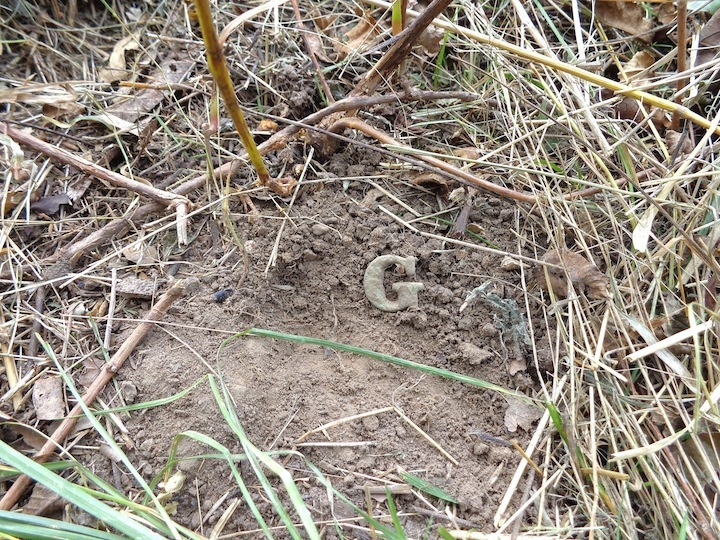 Found at Union camp, hut site, within the first two hours. 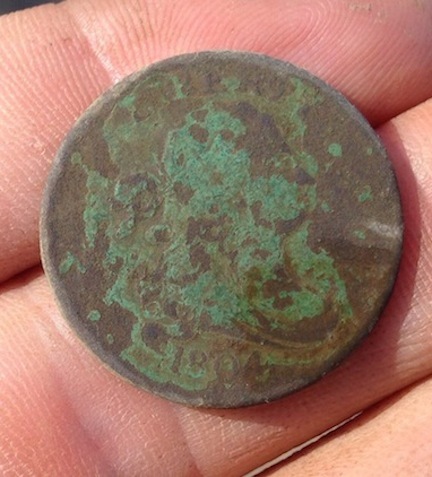 More finds with the F75 SE. Note the soldiers initials carved onto the canteen spout (HMY of HMV?). First two days on the new spot! The F75 is amazing! I never used the All Metal mode before, but it’s now my favorite mode. 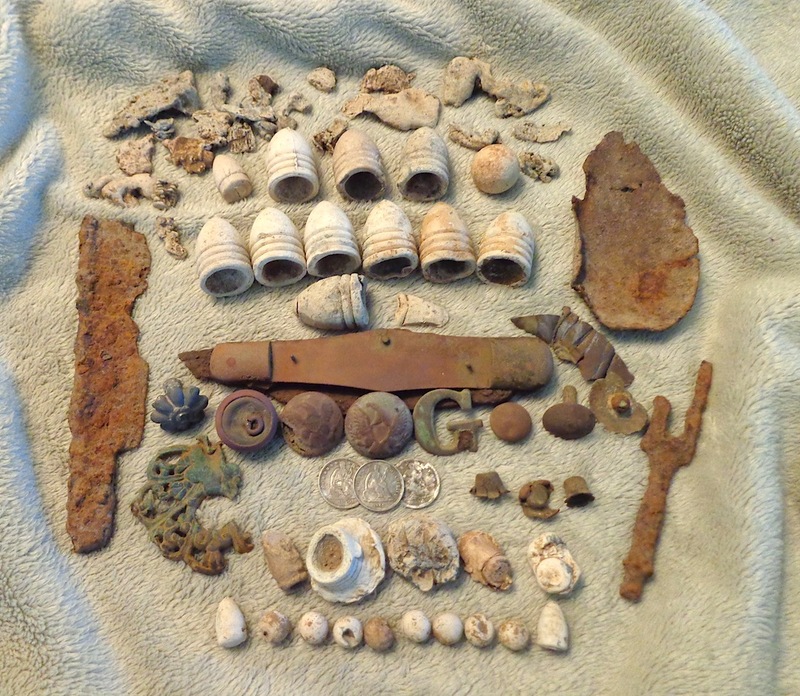 95% of these finds were very deep and just barely broke the threshold. 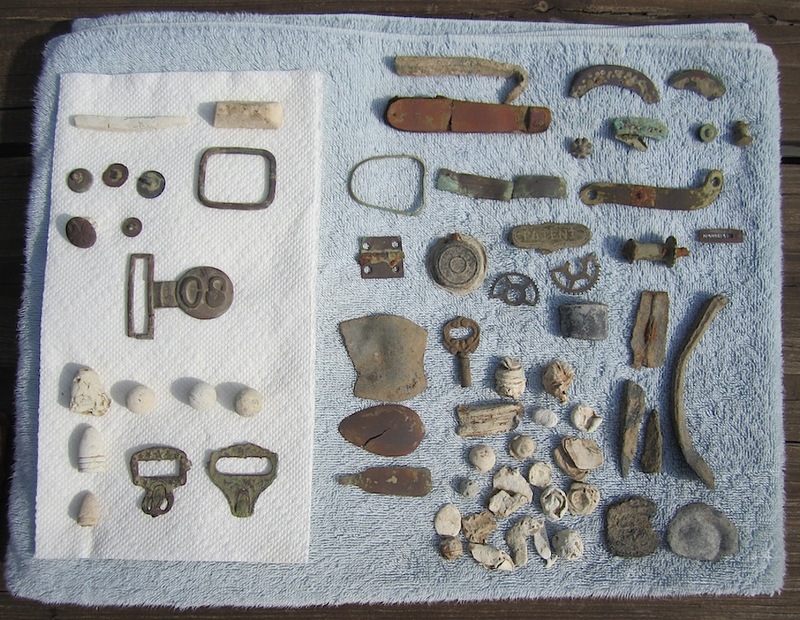 The Civil War camp has been hammered so it’s fun to get in there and find the deep stuff. The 9 bullets in the bottom left of photo were in the same hole at around 18” deep. I have 13 coins now! Since the start of 2012, I've been hunting the early Civil war camps (1861-62) here in central Missouri every chance I've gotten. The only machine I use in the camps is the Fisher Gold Bug DP. Don't be fooled by the name, because this machine can find it all. 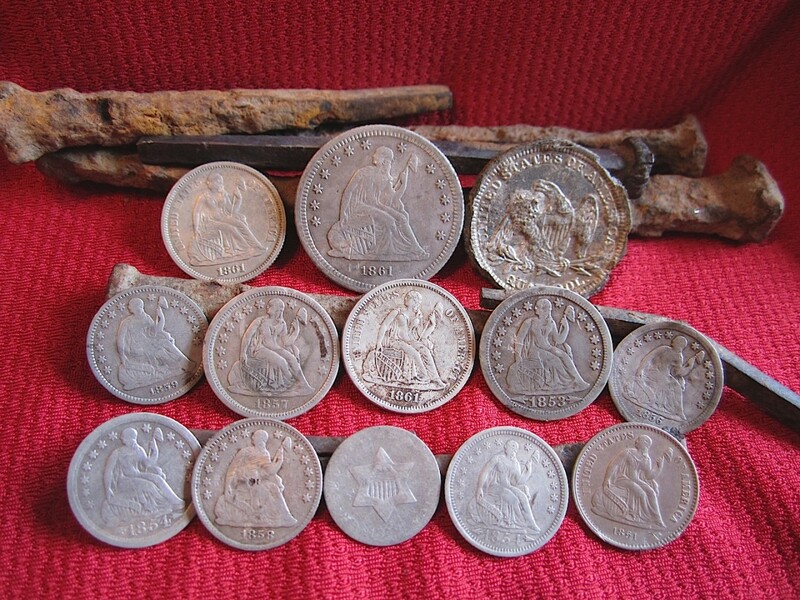 Aside from filling up several relic cases, these are the silver coins the unit has sniffed out so far this year. Almost every coin in the photo was mixed in amongst a bed of square nails. I strongly believe I have found the premier detector for iron-separartion. On 8/11/12, I was hunting a site in middle Missouri that I located through some research I had done earlier this year. In July, 1864, there was a one-day skirmish at this spot between approximately 50 Confederates and 50 Union soldiers. The only documented casualty that day was a Union Lt. who was shot and killed. Aside from this skirmish, there was no other documented Confederate activity in this area throughout the entire war. 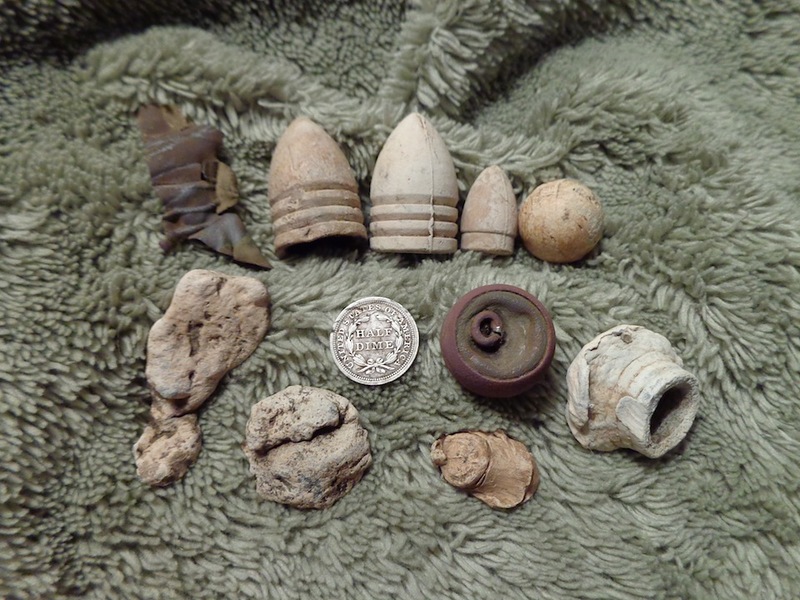 On 6/27/12, I was detecting a Civil War era homesite and found these four items. 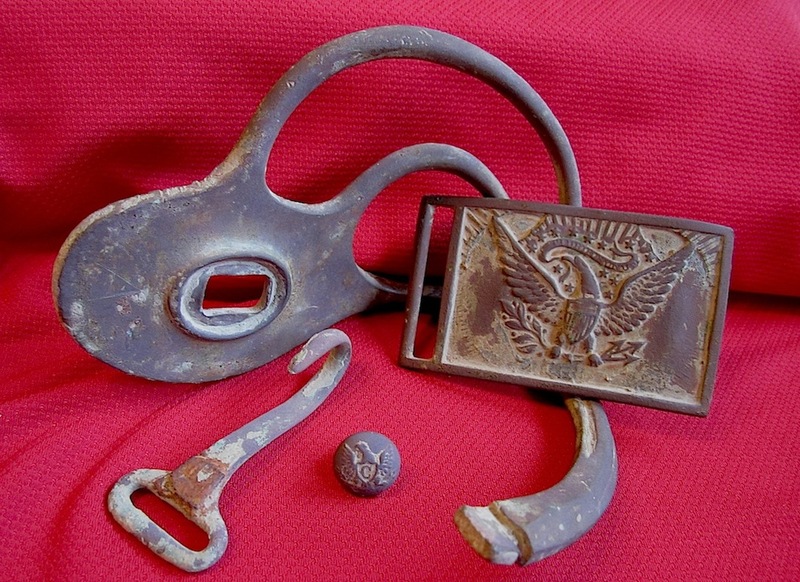 The button is a Cavalry vest-size button, the hook is a sword hanger, the large piece is a hand guard from a Union issue Cavalry sabre, and the buckle is a regulation 1851 Officer's sword belt buckle. 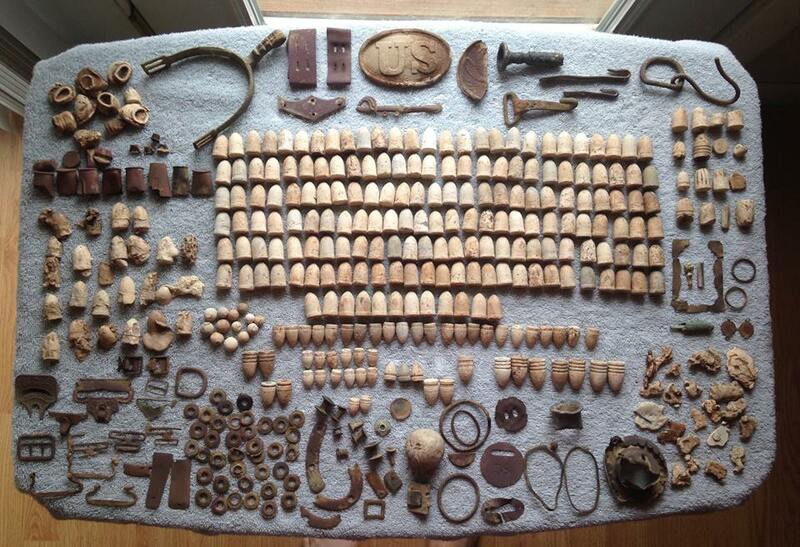 They were all found within 100 feet of each other. I started relic hunting with a Fisher F75, but have tried many different detectors from other major brands. Fisher is my brand of choice. When the Gold Bug DP was released, a buddy told me about the machine and that it was great for relic hunting. I went ahead and ordered one and I believe it's unmatched for the type of hunting conditions I have here in Missouri where iron separation is key for hunting Civil War sites due to the extreme amount of iron targets. For the performance of this unit, it is very reasonably priced.